Last week we launched an ideas competition calling for a redesign of the UK passport after Brexit. It offers the chance to radically rethink the contemporary idea of nation, says Sam Jacob in this Opinion column. A passport is a strange thing. Its great claim is that it describes who you are, it verifies you as yourself. It is a piece of paper that acts with total authority yet, at the same time, demands close scrutiny. Part pageantry, part technology and a potent national symbol, it is a piece of state machinery full of complex issues. And in the current political environment, it is a lightening rod struck violently by a host of inflammatory issues. I'm writing this airside, in a lounge overlooking the tarmac expanse of London's Heathrow Airport. I'm surrounded by champagne, a weird green marble wall, and muzak that sounds like Asian-tinged easy-listening late-80s Sting. This is more than just junkspace, it is highly polished extraterritorially, an international zone between borders, accessed only with the right kind of passport. There's a song about guys like me and places like this. Sade's lounge-jazz classic, Smooth Operator has a line that cuts sharp against the mood of the track: "He move in space with minimum waste and maximum joy". Another key lyric is "Coast to coast/LA to Chicago/Western male". This frictionless world is there for those with the right kind of papers and precious metal-tinted cards. To these global citizens, borders are gates that open with a welcome. But, as we've recently seen in airports and ferry terminals, for those without the right papers, space is far from smooth. So a passport is a document that creates and dissolves thresholds – not a footnote to space, but an intrinsic part of territorial organisation. One might even regard it as a form of architecture in how it shapes space and modifies how we move through it. One element of the kind of diplomatic legislation that can bend, warp and manipulate what otherwise appears hard and immovable. 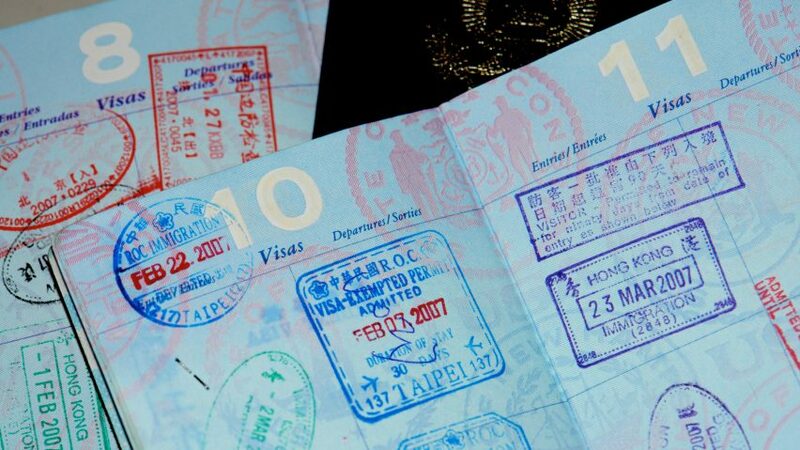 A passport is a form of magic that allows you to walk through walls. Like magic, in order for it to work we need to believe in it. The word "passport" derives precisely from this transmural power. The term for a document allowing its holder to pass through the "porte" of a city wall. Perhaps the passport itself is the gate, a document to which architectural properties have been transferred. Threshold transformed into a bureaucratic rather than physical construct. There is evidence of a safe passage document provided by Henry V as early as 1414, although the word passport only came into use around 1540. They remained rare even as railways made international travel more common in the 19th century. But borders tightened with national security concerns at the outbreak of the first world war, leading to the emergence of the modern passport. In Britain, the Nationality and Status Aliens Act 1914 created a single-page document that included a photograph, signature, and identifying physical descriptions such as "shape of face", "complexion" and "features". International passport protocols were agreed by the League of Nations in 1920, and in 1980 greater passport standardisation – including the machine readable passport – came through the influence of the UN's International Civil Aviation Organisation. Even in this potted history, we see the passport as a product of both politics and technology. First as a plea to protect and respect its bearer, later as mechanisms of security, and then tokens in global integration. The passport – like the nation state – is a recent invention. Before the late 18th century this idea of nation didn't exist. The 1646 Peace of Westphalia had established the concept of national sovereignty. But the first nations as we understand them were created by the French and American revolutions. Nations were defined by their citizens rather than a monarch's bloodline. Only later did industrialisation demand greater organisation to manage resources, while expanding empires required more centralised governance. As John Breuilly wrote in Nationalism and the State: "In 1800 almost nobody in France thought of themselves as French. By 1900 they all did." Ideas of national narrative and myth – though apparently "natural" parts of our identity – only emerged after this. As Massimo d'Azeglio, a leader of Italian unification declared: "We have made Italy; now we must make Italians." Nation, citizenship and the passport develop hand in hand. To think of any as true or fixed is to misunderstand their real nature. Beneath the friction-free frequent-flyer veneer of my own citizenship is a seething history of bureaucratic complexity. Generations of expulsions, displacements, war as well as opportunity, luck and I dare say some slight of hand have created a familial diaspora of multiple passports and shifting citizenships. Like anyone, I believe my own truth to be universal. But this time I think I'm right: Nationality is not truth. Not a lowly version of divine right coursing though our veins conferring the gift of identity. Nor as certain as the landscape, whose image is branded across the British passport page by page: Village Green, Formal Park, Lake, Woodland, Moorland, Reedbed, Geological Formation, Coastal Cliff, Fishing Village, Canal; as if identity were as solid as geology. Nationality is not a state internal to us, but an event that unfolds around us. Not fixed but approximate, and ragged around the edges. Tacked on provisionally, yet stamped with authority. That's what makes the nation state – and the passport – a design project. Indeed the word statecraft implicitly suggests the act of making, of forming, of design itself. When we hear nationalists declaring how they will make "country X great again", "take back control" or otherwise call for the apparent restoration of a national past, we should remember that: A. These pasts are fictions; B. These ideas of nation are neither natural nor normal; and C these calls are for the radical new type of national entity not a return to simpler values. In a country famous for its visual illiteracy, the design of the passport has become a ridiculously hot political potato. During the televised Brexit debates Nigel Farage rummaged in his pocket to brandish his passport, waving it around declaring: "This should be a British passport. It says European Union on it." Around the same time a Sun front page read "TRUE BLUE ... NOT EU" with the subtitle "Time to bring back the Great British Passport". The colour change would, apparentley "affirm national identity". Tory MP Andrew Rosindell declared: "It's a matter of identity. Having the pink European passports has been a humiliation." Meanwhile Tory MEP Daniel Hannan, mastermind of the Leave campaign, declared a return to the blue passport would "remind us, and the world, of what we did vote for – to be, once again, a free people, living under our own laws". This obsession with the passport as pagentric paraphernalia suggests a naive concept of nation. Like a Disney castle, it imagines nationhood produced by the accumulation of symbols: Flags, stamps, banknotes – and yes, passports. As if these gestures themselves (as opposed to, say, economic policy or understanding of the mechanisms of government) were the means of constructing nationhood. The UK's current passport does feel like a relic. The golden coat of arms on the cover, the frontispiece written in frilly calligraphy like an invitation to an over-planned wedding. This kind of pomp has a special place for the British, whose history, uninterrupted by revolution or occupation, means state pageantry has never been torn up. Even at the heights of Cool Britannia there was no Peter Saville makeover of the passport. But while the far right – who paradoxically lambast the left as snowflakes obsessed with identity politics – act hysterically about the colour of a piece of cardboard, technology means even the physical fact of a passport is absurdly old fashioned. We already see biometrics installed in ePassport gates. Information in your passport's RFID chip is fired down cables, crossed referenced against multiple databases and matched against the image feed from the cyclopean electronic eye. No need for a passport, your own body acts as a document verifying you in the eyes of the state. I've also seen this technology in the showroom of a smart-tech infrastructure company, where I came across a seemingly innocuous yet Narnia-strange lamppost set against a photomural of a street. The lamppost featured a hidden camera. As you walked into its view, software mapped a digital net across your face, just like Snapchat, and assigned a database entry to your profile so that, in theory, the system could track your movement through space. The border is now everywhere. Biometric technology might, however, not always be about surveillance and control. The same technology is the basis of Aadhaar, a new identification system for India's 1.25 billion population. Using an iris scanner, a fingerprint machine, a camera and laptop, 1.09 billion Aadhaar numbers have been issued. The aim of the programme is to help modernise government administration while also giving better and fairer access to state services, to welfare and banking. In other words, replacing bureaucratic documents with a biometric profile provides access to many communities who were previously excluded. Biometrics could be seen as just digital updates of the photograph, the fingerprint and the signature, each a form of identification. They all carry different meanings, construct identity in specific ways and have ideology hidden within their science. The passport photo for example has strict rules about format, size, background, hair, expression and clothing. It seeks to create an image suppressing individual expression in favour of a "true" identity. The signature is an active mark of individuality. The thing in the corner of a canvass conferring authenticity and value. The quick gesture of celebrity that records encounter. The ink that, as it dries, brings yet another executive order into force. The fingerprint however is something taken from you. And the story of its origin is a morality tale for all forms of identification. It was developed accidentally by the British colonial administration in India, when William James Herschel, chief cagistrate of the Hooghly District in Jungipoor, found dealings with the indigenous population complicated. One day, frustrated while drawing up a contract with a Mr Konai, Herschel made him put a handprint on back of the document to "frighten [him] out of all thought of repudiating his signature". Herschel continued with this habit, finding that personal contact with the document made the contract somehow more binding. In short, the first wide use of fingerprinting was not based on scientific evidence but superstitious beliefs – on both sides. Superstitions remain intrinsic to the passport. Superstition that it affirms identity and security. Superstition that it tells the truth. Superstition that its symbolism and language have power. Supernatural too in the way it opens and closes walls like a spell. Passports construct identity within specific terms. They negotiate personal, public and civic identity. As they do they operate not only as a record but actively to construct citizenship, nation and the associated issues of border, rights, protection and responsibility. If this is the case then we can also imagine how the design of a passport might create new kinds of identity and citizenship. Technologies like blockchain could allow the process of identification to be delaminated from the state. This kind of crypto-citizenship might suggest an alternative citizen outside governmental control. Equally, variations in a passport's symbolism might allow alternative narratives of both nation and the individual. What new national mythomoteurs might drive the passport's design? How might an individual's own expression fold into the official registers of identity? How might reconsidering the passport as a design project radically remake the contemporary possibility of nation? As an isolated, defended citadel-nation? Or as a progressive, open territory within the world? Sam Jacob is principal of Sam Jacob Studio, professor of architecture at University of Illinois at Chicago, director of Night School at the Architectural Association, and the editor of Strange Harvest.